I have a friend who retired after many years as a Superintendent of Schools with many accolades and awards, a highly respected professional. When interviewed by her local paper, she was asked if, given the chance, would she make the same career choice? Her answer wasn’t completely clear to the reporter, but it struck home with me. She said, “I would teach again, but ONLY in an orphanage.” What does that mean? The children are amazing, but the parents are a nightmare! Who’s with me? 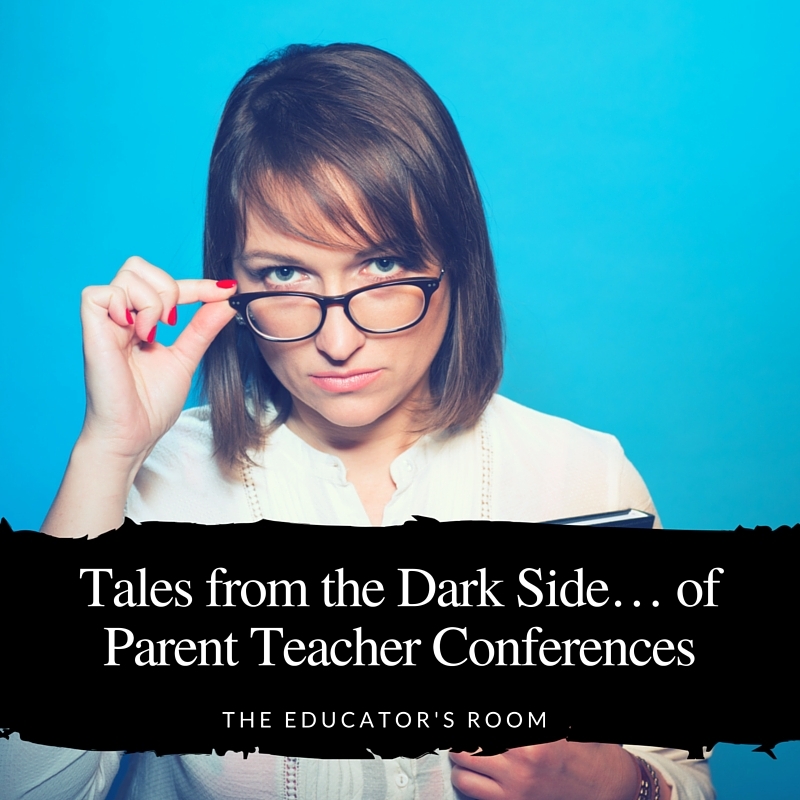 So as the school year winds down and I sit here reminiscing, I recall many conferences that changed me. And remember, this site is not fictitious: I couldn’t make up stuff this good if I tried! My very first year of teaching, I met Johnny. Johnny had “school phobia,” as described by Mom, causing him to have extensive absences. If a doctor had diagnosed this issue, a 504 could have been written, but Mom and Dad were prominent citizens of the local rural community, highly respected for something, I don’t remember what. If they took Johnny to THAT KIND of doctor, what would the neighbors think? Dad was also on the Town Council. Add this to the fact that they were going through a messy divorce, custody battle, and generally being dramatic and public with their dirty laundry. Poor Johnny needed help. My classroom was federally funded and designated for At-Risk students, fifth graders deemed at risk for dropping out. These were grey-area students who didn’t qualify for an IEP but were just very low academically and socially. Mom and Dad were highly offended and embarrassed that Johnny was in my class to begin with, much less that his attendance (or general lack thereof) would be called into question. They set out to get him transferred in to a different classroom, but the principal held firm when the attendance didn’t improve. So in March, we had a mandatory meeting about transitioning to sixth grade. But I must first mention that as a newly single gentleman, Dad had been arrested for brawling at the Top O’ the Hill Tavern. In fact, it was common knowledge that he had his ear bitten off by another political rival. It had been sewn back on in the emergency room, but not yet treated by a plastic surgeon. So enter the meeting myself as a first-year teacher and these two angry parents. They resented me because I represented the classroom they didn’t want their child affiliated with, and of course, they resented each other. They sat, each at the end of a six-foot table. They refused to sit facing me. I think I should mention that it was his left ear that had been bitten off and repaired in a Frankenstein style fashion, and sitting to my right, I had the perfect view of this eyesore. As I reviewed the data, Dad wouldn’t make eye contact, so I literally spoke to the Frankenstein’s ear. It was so difficult keeping my focus when all I could think about was the brawl, the ear biting, and Frankenstein! Then I got to the point of the meeting, which was that the principal and guidance counselor wanted to recommend retention. Both parents hit the roof, but, instead of yelling at me as I expected, they were yelling at each other! I learned some new phrases, I learned new gossip about their family, and I learned to never hold a parent conference with this much potential for trouble without an administrator who would support me! Sadly, this child was not retained (and I’m usually not a believer in retention). He was pushed through middle school and dropped out of high school. His parents passed him back and forth for years, and he never received the help he truly needed. I hope the remainder of all my epilogues won’t be this sad. More to come. Next week- The Knife Wielding Biker! My name is Madison and I am a student teacher in Michigan. When reading your blog, I found similarities to some of the parents I have in my classroom! Of course, all of their ears are normal and their own. How do you deal with parents that don’t acknowledge the fact that their kid needs help? Thats only putting more pressure on the teacher to take a bigger role in helping the child. Of course, theres the other types of parents that are involved too much or put too much pressure on their students to succeed that the student is miserable and has anxiety. How can teachers help parents find the right balance? A question to ponder for the rest of my career I’m sure..